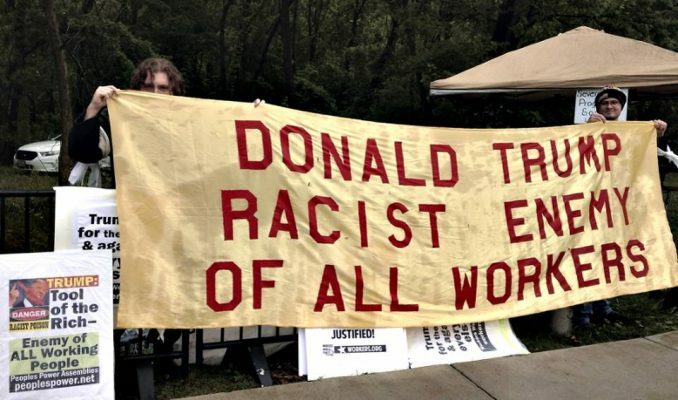 Protesters from Virginia and beyond confronted President Donald Trump and all he represents on May 13 at Liberty University in Lynchburg, Va. Beginning in the early morning hours, protesters set up a picket line directly across from the university where Trump was the commencement speaker. Sponsored by the Seven Hills Progressive Society and supported by organizations such as the Roanoke Peoples’ Power Network, protesters of all ages, nationalities, genders and sexualities held a strong line for more than three hours. Chants included “No Trump, no KKK, no fascist USA,” and a rainbow of placards and banners denounced racism, sexism, bigotry and U.S. wars.